Now with simultaneous charge and sync for Apple and certain other devices. 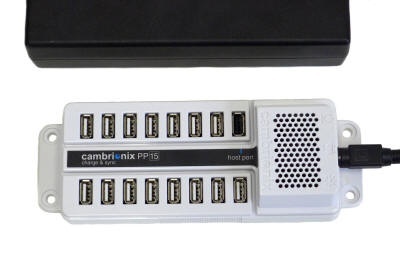 The DS-SC-PP15 is a universal USB charging device that adjusts each port to the optimal charging profile for each device as it is plugged into the hub. 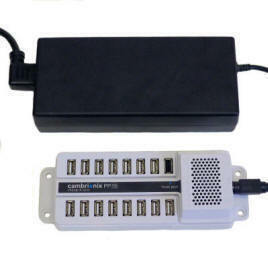 This version also acts as a USB hub for file transfer and syncing content. It will charge iPads™, iPods™, iPhones™, mobile phones, Kindles™, Nooks™ and other eReaders, and tablets, providing up to 2.1A per port even when fully loaded with devices. It will charge virtually any device that standalone charges with USB. For syncing, USB devices that can be managed through a host connection can be recognized for file management. iTunes™ and MDM software that connects through USB will sync to devices on these hubs. This advanced hub is also future-proof: its firmware can be updated with new charging profiles as new USB devices are introduced. It helps preserve the battery life of your devices and assures you that you can accommodate any device that is made for USB standalone charging (without a host). Unique Open API to permit user-defined scripts to monitor or control each connected device. Includes an update “host” port for syncing and firmware: Download new charging profiles from the web and update the charger’s firmware. User-updatable firmware makes this future-proof. Power supply: 180W. Power supply is dual voltage 115/230 VAC.